You all know I have pitiful lashes. I look at them and I think: Why, God? Why?!!! STEP 1 ~ Curl Lashes. Make sure you curl them from the roots. STEP 2 ~ Apply a fibre mascara base. Skip this step, if you don't have one. Apply mascara while it's still wet. STEP 3 ~ First, I'm using a lengthening mascara. 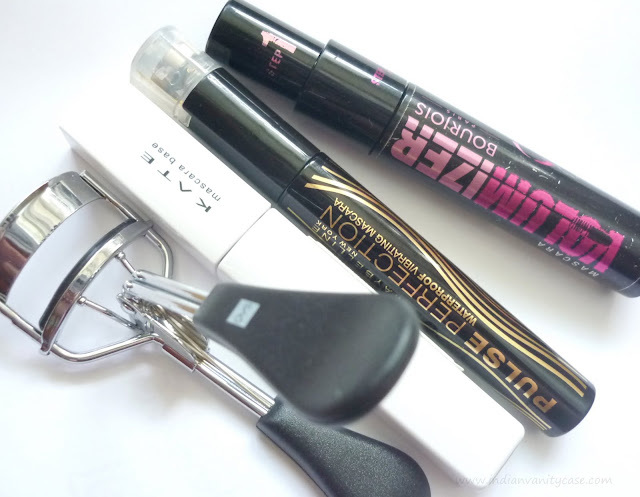 Here, I'm using Maybelline Pulse Perfection Mascara with the vibrating wand. STEP 4 ~ While previous mascara is still wet, apply a volumizing mascara, but concentrate application on the roots of your lashes and outer corners. Here, I'm using Bourjois Volumizer Mascara. *After STEP 4, I usually comb my lashes while they're still wet- if they look too clumpy, but I misplaced my lash comb. STEP 5 ~ Apply mascara on your bottom lashes. love your tutorial. can you tell me whether any of the brands available in india make fibre mascara base?? Indgal- Fibre base aren't available here, to my knowledge. great post! LOVED it <3 thanks for sharing. I used to be so scared of the curler but now I love it... even I have chottu lashes this is such a grt trick no!!! Hey there ... new to ur blog and loving it ! Any idea where I can purchase a good quality eyelash curler ? which brand would be good for a beginner , preferably available at a counter in one of the malls ? P.S. Im kinda lucky to have thick and long eye lashes but they are kinda straight-ish ... wanna curl them for special occasions ..
U knw sum magic tricks! I like the simple brown eyeshadow look.. can you do a tutorial of that please? i do everything the same as you do! :) and love the eyeshadow look here! u know what, i dont even own a lash curler!. did i hear girls gasping.? nice tutorial, love your pics. how do you get perfect lighting cynthia? Wow! the picture where uve done one eye and the other one is bare is so cool! nice tutorial cynthia! wow looks grt..my eyelashes r same like urs..
LGG- I use a Panasonic Lumix. Thanks! missprint- Than u! QVS, MAC, and Vega- u can pick from those in India. Fphd- Ya, huge diff :). Thanks! Great tutorial! It look totally different. What e/s do you used from naked palette? I find there is no need to use a lash curler if you use a curling mascara like maybelline hyper curl....your thoughts?